A professional pre-workout product based on four synergically complementary active ingredients that together will make your training even better, even more intense, that will make you think about true transcendence. It's real power and energy in a compressed form. Get to the next level and prove that you can reach the impossible. OstroVit SHOT is a professional liquid diet supplement for athletes. 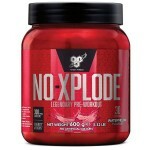 It contains a complex of the most effective substances aimed at increasing strength, concentration, muscle pump and promoting better and more intensive training. Ostrovit SHOT is characterized by a unique, intense and aromatic citrus-lime flavor that will take you to a tropical state of freshness, and after a while feel the truly electrifying energy and readiness for your best and dream training. Ingredients: water, beta-alanine, L-arginine alpha-ketoglutarate, citrulline malate, anhydrous caffeine, acid - citric acid; acidity regulator - trisodium citrate; aromas, maltodextrin, sweeteners: sucralose, acesulfame K, neotame; preservatives: sodium benzoate, potassium sorbate. WARNING!!! A tingling sensation or stinging of pins all over the body is the merit of beta-alanine, which causes so-called paresthesia. It is a natural reaction of the body to a high content of this active ingredient, by some considered an asset and an additional motivational cop. HOW TO EAT OSTROVIT SHOT? 1 serving - ½ bottles (30 ml) to drink before or during training. Do not exceed 1 portion during the day. Shake before use. Consume 24 hours after opening. REMARKS: Do not use if you are allergic to any of the ingredients of the supplement. Do not mix with alcohol. Due to the high caffeine content, the product is not indicated for diabetics, people sensitive to caffeine, hypertension and other cardiovascular diseases, children, pregnant women, breastfeeding women. Dietary supplement can not be used as a substitute (replacement) of a varied diet. Keep out of reach of small children. 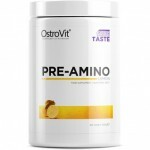 OstroVit PRE AminoPRE-AMINO 400 G T..
TRI CREATINE MALATE 300 G TRUE TASTEOstr..